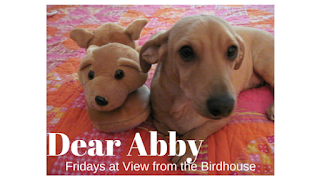 Abby, thanks to you and your Mamma for this special blog post. I love hearing the stories about all of you! Each one such a different personality and touching our hearts in such a unique way. It is nice to read about your pet family, especially since you have been kind enough to highlight all of ours! These pups are all so adorable. It must be nice to take time to remember them and their special personalities. Aww, Trish. What lovely memories of these special dachshunds I remember them all but hadn't realized Lucy was so like my Lili - loving pink, dressing up. Thank you for posting this. It warmed my heart. I loved reading your blog about your babies. I know they all have a special place in your heart forever. Thank you for sharing your babies with us. They were all so precious. Trish, you are so right when you said the memories are happy but sad at the same time! I never tire of hearing about your fur babies and their different personalities and the happy times you had with them. It always makes me smile to hear their names taken from characters from Mayberry. 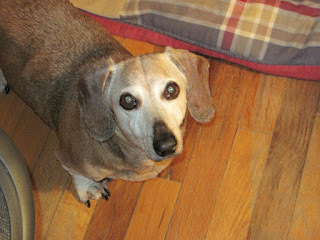 I'm waiting for you to adopt another female dachshund and name her Aunt Bea! So goodness what a sweet story of sweet babies! So precious! Aww I love this so much! I miss my puppies of the past. Having to say goodbye is the worst part of having a furry companion. I had a friend who had Dachshunds and she loved the breed. They both look very sweet. It's so hard to lose our furry family members. Awwwww, what a sweet post!! My mom absolutely loves dachshunds. She had them when she was growing up and always wanted another. When my parents' last dog (a Westie) passed away a few years ago, she made it her goal to FINALLY convince my dad to get a dachshund. But of course, they went to a shelter and fell in love with the sweetest little dog who is definitely NOT a dachshund... but she tells everyone that he's a quarter dachshund, and we all go along with it because it makes her happy, hahah! Aww, these stories are both touching and sad but with good memories of these special dogs. What a sweet dog, even if she did steal dinner sometimes! ;) Thanks for always bringing us fun stories about these adorable pets! I don't have any let's, but it's so interesti g the gear of the enormous personalities they have. They are all so different and bring special meaning to the lives of the people around them. That is for sharing these stories, so fun! 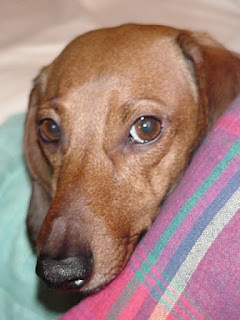 My first dog as a kid was a miniature, long-haired, black and tan Doxie like Thelma Lou. His name was Thunder and he was the best dog! He didn't really like strangers, but when my little brother was born (I was 8), he was so so good to him. My brother started crawling and pulling all over him and Thunder just sat there, letting him. This is a very unique read for me. I was definitely entertained! I have a little Shih Tzu and he is the sweetest thing in the world. He can be annoyingly noisy at times though. He wants us to know he's got our back. Haha. Thank you so much for the very kind comments about the special dachshunds that have lived in my family! Dianne, I remember your dear Lili loved pink, too! Mary, we may have to adopt an Aunt Bea at some point in the future! :-) That is a very cute name. I loved reading your pet memories too!